The 1960s Cold War years were America’s peak fear/fantasy period as far as the threat of nuclear weapons being deployed. Related scenarios played heavily in science fiction works and frequently surfaced in art and writing. On occasion the line between sci-fi and urban planning tends to blur, at least in hindsight; such is the case for architect and city planner Oscar Newman’s probably tongue-in-cheek vision of an enormous spherical underground replica of Manhattan located thousands of feet below the city itself, to be switched into action in the event of a nuclear event. 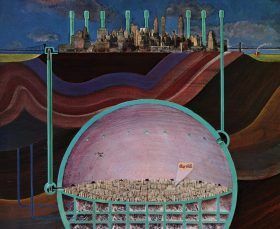 Atlas Obscura reveals Newman’s fantastical map to a subterranean metropolis where New Yorkers would wait out the fallout.